Click here for the rest of the stops on the tour! Jason! He was such a great character. At first, he was introduced as this shy, meek kind of guy. You know the kind. Quiet. Awkward. Perceptive. And suddenly, he morphs into this selfless, brave, and strong character. He stood up for what he believed in and wouldn't back down. His determination was so great to read about. He's not a character I've ever come across often in YA and this sweet--yet strong--protagonist made this book that much more original. Speaking of original, there was time travel! Also, they happen to travel to one of my favorite time periods in history. It was fantastic. 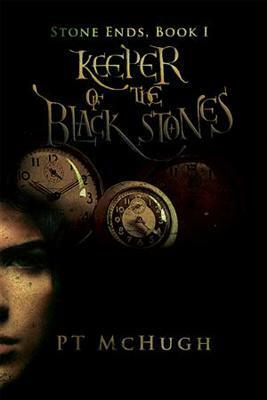 The historical accuracy of the novel made the book that much enjoyable for me and McHugh's take on time travel with these stones was interesting. There was plenty of swords and armor and battle and all that great stuff that comes along with time travel and epic adventures. However, I would have preferred more of a flow to the reading--a consistency. Also, it was a little awkward here and there, but not in the good way. It was a little rough around the edges for me, but other than that, it was a great read. Keeper's original take on time travel that brings readers to Medieval Europe makes for an epic adventure that had me turning pages as fast as I could. Being that I enjoy reading historical fiction of any kind, I enjoyed the book and can't wait to see what will happen next! Fans of time travel, sci-fi, and rich history may possibly enjoy this book. About the Author: PT McHugh didn’t start out as a storyteller. He was, however, born into a family of that encouraged imagination. He became a fan of history in school and then went to college to become a construction engineer, to build a world of straight lines, angles, and equations.